Stressful day at work? Deadlines, huge workloads and navigating office politics – some working days just don’t go to plan. When you get home in the evening there are some things you can do, however, to reverse the horribleness of the day. Instead of lying awake thinking over the stress of the day, do these four things. You will get a better night sleep and wake up ready and raring to face tomorrow. Girls and guys, you should try these! I’m obsessed with this unisex Jo Malone Orris & Sandalwood fragrance right now. It’s really soothing and comforting – just what’s needed after a long day in the office. Wipe away the grime of the day with one of these Garnier wipes. That’s your face feeling refreshed, now onto your (probably) aching body. A relaxing body oil is a great way to soothe yourself to sleep. With calming scents of lavender and rose, this oil feels luxurious and pampering on your skin and will leave you feeling super chilled out. Plus the large bottle will last you forever. 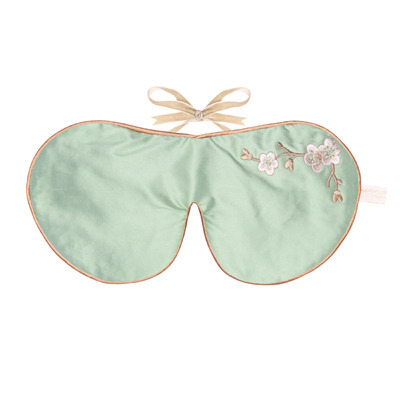 This beautiful eye mask from Holistic silk will be your new best friend when bedtime rolls around. Made in Britain from pure silk and filled with dried lavender, this mask will send you gently off to sleep. Pillow spray is a great way to give yourself an extra boost of relaxation when your head hits the pillow. This Works did extensive research into what helps people sleep better and after surveying people using this Deep Sleep Pillow Spray, the company found that 89 per cent of users fell asleep faster than normal and a whopping 92 per cent felt more refreshed in the morning. Surely those statistics show that it is worth a try! Not only will Ren’s Wake Wonderful Night-Time Facial give you glowing skin come morning, but it also reduces the level of the stress hormone cortisol. The treatment works to enhance your skin’s natural nightly renewal process and you won’t be disappointed with the glowing results.